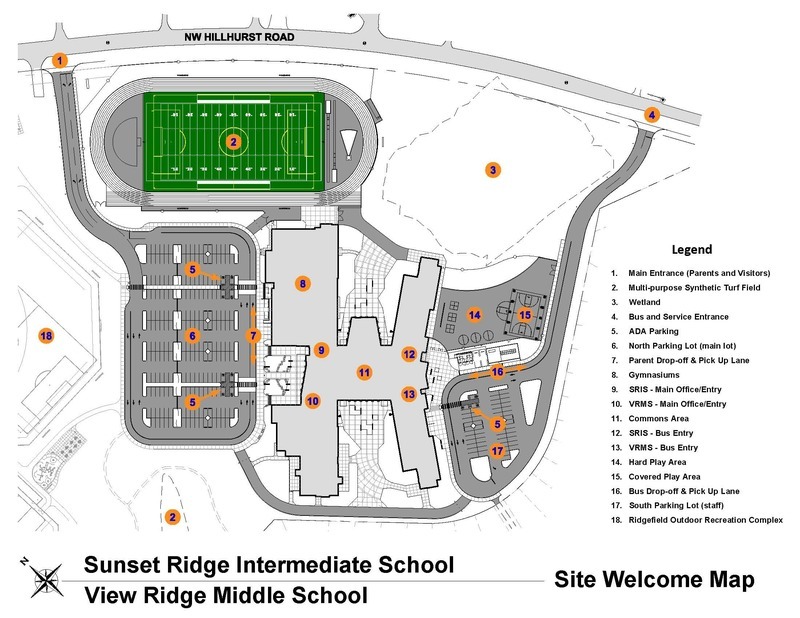 If you are planning to drive to the new 5-8 school campus, especially to drop off and pick up students, here are a few important guidelines to keep in mind. Please refer to the diagram below. There are two entrances to the campus—the North Parking Lot Entrance (1) and the South Parking Lot Entrance (4). The main entrance at the North Parking Lot (1) is for visitors, vehicles dropping off and picking up students, bike riders and pedestrian traffic. The South Parking Lot (4) is for school buses loading and unloading students (16), staff parking (17) and deliveries. Cars will not be allowed into this parking lot during drop-off and pick-up hours. Drop-off hours: 7:40 am - 8:05 am. Enter the North Parking Lot (1) and keep right. The two right lanes move counter-clockwise around the perimeter of the parking lot and loop back to the main entrance on Hillhurst Road. For student safety, please drop off students at the curb (7) using the right lane, then move into the second lane to proceed to exit. Use the inner left lane if you plan to park (follow the arrows). Pick-up hours: 2:10 pm - 2:40 pm. Enter the North Parking Lot (1) and keep right. The two right lanes move counter-clockwise around the perimeter of the parking lot and loop back to the main entrance on Hillhurst Road. For student safety, please pick up students from the curb (7) using the right lane, then move into the second lane to proceed to exit. Use the inner left lane if you plan to park (follow the arrows). In the first several days of school, directional signs will be posted, and staff will be on hand to help direct traffic. To ensure a safe and orderly start and end to each school day at the new campus, we ask for your patience and cooperation as we all work together through this new process.